It’s almost the end of the school year and there’s still time to show appreciation to your child’s teacher. Hopefully, you have spent the entire year thanking her or him (and if not – tsk tsk). See, teachers don’t expect gifts from their students, but they are always appreciated. Teachers work hard all year long and usually feel undervalued. Giving them a small gift to say that you’re thankful for them is a wonderful idea. A little goes a long way, so even if you can’t afford something fabulous – don’t fret – there are plenty of ideas that won’t break the bank. Here are a few cute and cheap teacher gift ideas to start working on now. As a former teacher who worked in some of the poorest schools in the city, I didn’t expect expensive (or any) gifts from my students. However, when I did receive them, the ones that were created with care and imagination were my favorite. I remember receiving a gift box with half of the contents taken out, but I loved it anyway because I was important enough to a child’s life that they would give me something. Trust me, the thought is what counts most. Who says you have to spend a lot of money on a gift? 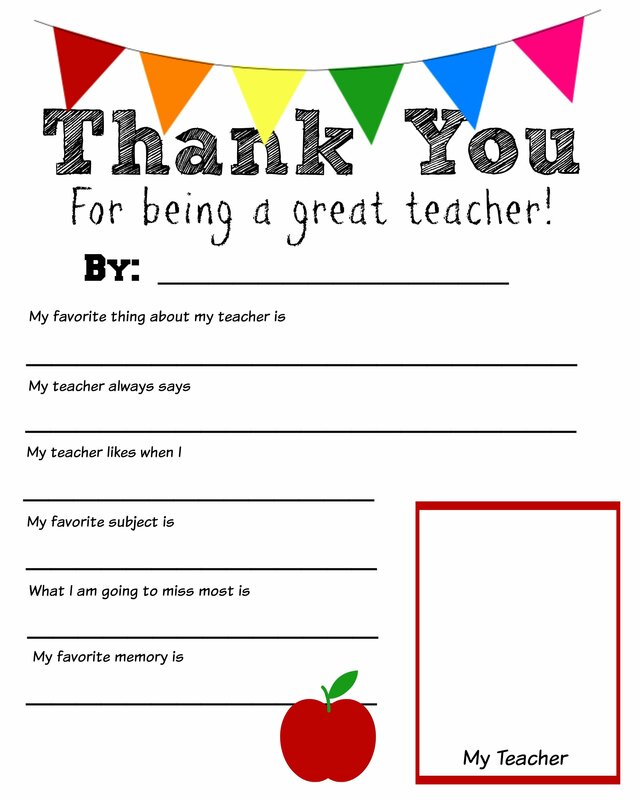 Why not have your child fill out a printable such as this one to give to your teacher. All you need is a color printer and crayons and time for your little one to get to work. This idea is from The Suburban Mom and it’s a great way to show a teacher how much they are appreciated (for free)! Teachers never have enough supplies, so if you have any laying around – use them to create a School Supply Cake. The hardest part about putting this gift together is ensuring that the contents stay put. If you use the guide by the Happy Go Lucky Blog, you may want to use ribbon to keep supplies together. Have your child’s teacher yearning for the beach with this Fun in the Sun End of the Year Gift idea from Skip to My Lou. Go here to find the instructions, but basically fill up a tote bag with fun items someone will take to the pool or beach with them. I found this teacher gift to be the cutest. As someone who doesn’t have a green thumb, I envy anyone who can take care of flowers and plants. Giggles Galore has a “Thanks for Helping Me Grow” Flower Pot, which is not only affordable but also a great appreciation gift to give to a teacher. This particular project may take a few extra steps, but trust me – it’s worth it. Look for the instructions here. Sometimes getting a gift card will be the best teacher gift option. If you are short on time or skills, don’t feel guilty about picking up a gift card for a teacher. Trust me, most teachers prefer them. 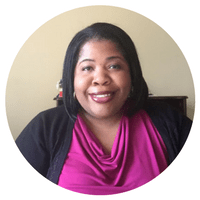 Chickabug has the cutest printables that you will want to include with your gift card. Go to Chickabug’s blog to download the printables for this teacher gift. If you sign up for Swagbucks, you can earn gift cards to your favorite stores to keep or (hint…hint – give to a deserving teacher as a gift). Who doesn’t like a cute mug? I love them and like most people, a cute, fun, and interesting mug can make even the most strict teacher smile. Show your artistic skill and help your child to design the best looking mug their teacher has ever seen. These DIY painted mugs are from Glued to My Crafts Blog. Go there for instructions and inspiration. What else is there for a teacher to do over the summer, but binge on Netflix movies? You already know that between teaching, testing, conferences, and meetings – most teachers haven’t watched television in over ten months. Help them to catch up on their favorite shows and movies with a snack and popcorn box. Include some of their favorite snacks encourage them to kick back and relax. You can find instructions to a similar one here on Surviving a Teacher’s Salary. Check out 76 Teacher Appreciation Gift Ideas over at Craftaholics Anonymous.